Washington (CNN)Former President George H.W. 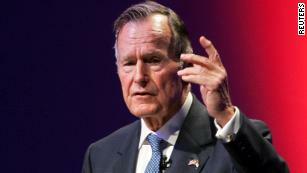 Bush was remembered Thursday as a man of humility, honor and humor at the Bushes’ family church in Houston, providing the nation with a last farewell before he begins his journey to his final resting place.Family, friends, politicians, musicians, actors and athletes filled the pews of the St. Martin’s Episcopal Church to say goodbye to the 41st president with heartfelt praises and gospel music, as well as some moments of levity. Bush “had a very effective way of letting me know when the discussion was over,” Baker recalled.”He would look at me and he’d say, ‘Baker, if you’re so smart, why am I president and you’re not? '” Baker said to laughs. “He was a leader and he knew it.”The former aide also reflected on Bush’s lifetime of military and civil service, calling the former commander in chief “temperate in thought, in word and in deed.”Texas Land Commissioner George P. Bush also eulogized his grandfather, sharing personal anecdotes about “Gampy” that showed the elder statesman’s devotion to his family.Bush remembered how “Gampy” would host “intense” horseshoe games, go fly fishing with them in Maine and let the grandchildren “nestle up between him and ‘Ganny’ when they read the paper. “He called it an “honor of a lifetime” to share his grandfather’s name.The former president’s granddaughters also read scripture at the service. Country singer Reba McEntire and the country quartet, The Oak Ridge Boys, both performed songs during the service.Before the service, Bush lay in repose at St. Martin’s Episcopal Church from Wednesday night until Thursday morning.Houston has been Bush’s home for years since he left the presidency, and the family has worshipped at the church for decades. The church was also the funeral site for his wife, former first lady Barbara Bush, earlier this year. Briefed in 2011 about his funeral and lying in state, the 41st President asked with typical humility, “Do you think anyone will come?” Tonight, people are waiting hours to pay their respects. This photo, taken Monday, is courtesy the Senate Press Photographers’ Gallery pool. 1,849 people are talking about thisTwitter Ads info and privacyAfter the Houston funeral service, Bush departed the church in a motorcade procession to the Union Pacific Railroad Westfield Auto Facility.A departure ceremony took place before Bush took his last trip by train to his final resting place. The funeral train departed on a 70-mile route, taking Bush from Spring, Texas, to Texas A&M University in College Station, the site of the Bush Presidential Library and Museum.Once there, Bush’s casket was carried through a military honor guard cordon, followed by his family.A private burial service conducted by the Rev. Dr. Russell Levenson, Jr. and the Rev. Peter G. Cheney followed a Navy jet flyover.